I've been kind of lazy about keeping up with writing lately. Sorry...I think it's mostly because I started watching Once Upon a Time and it has led to a somewhat unhealthy amount of binge-watching. Luckily I'm almost caught up, so hopefully soon I'll be back with reality and more prompt and detailed in my posts. 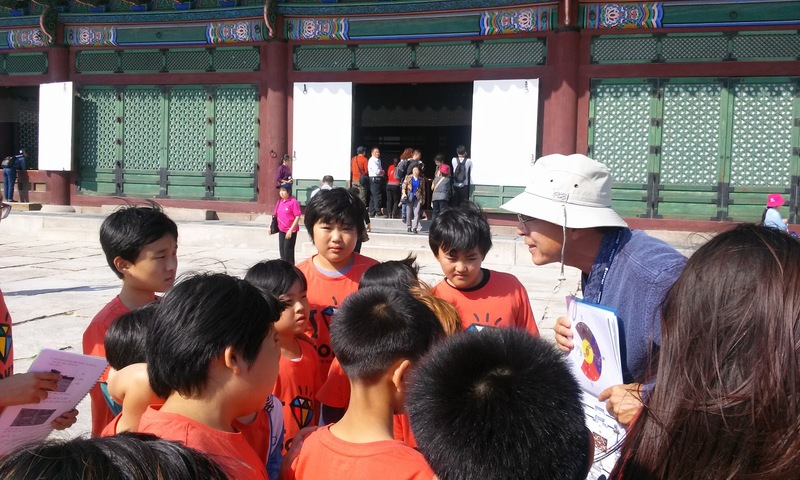 Anyway, one thing I need to catch up on is the field trip I went on with my students last Friday. This is the third Friday in a row I haven't had classes, so although I was somewhat bummed I didn't have the day off like many teachers at other schools, I couldn't really complain about going on a field trip with a bunch of adorable kids. We left school bright and early in the morning at 7:30 to head to Seoul. In my mind I thought we would be there by 9:30, but I forgot one thing...small children need bathroom breaks. 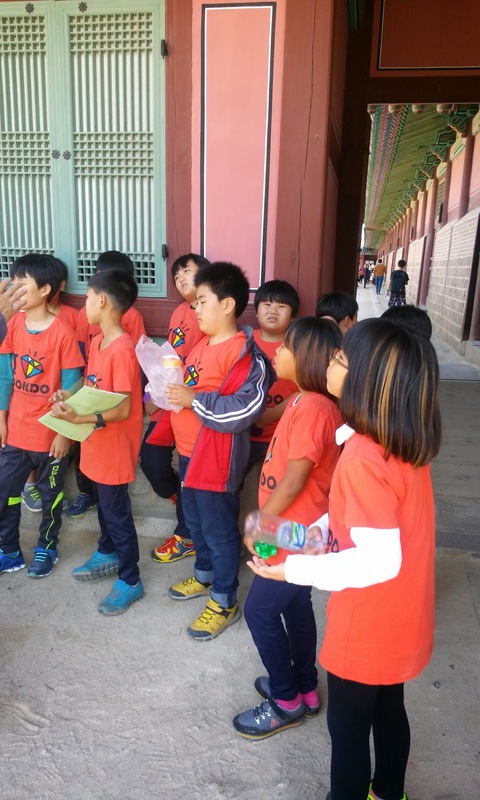 Buses to Seoul from Jeomchon usually don't make any stops, but due to the sometimes unstable bladder control of the younger students, we made a stop at one of the rest stops, at which point the kids all got their shares of unhealthy foods. After our pit-stop it was another hour on the bus with sugared-up kids, during which my co-teacher decided to show me his music collection and proudly told me "I have some English music." "Oh yeah? What English music do you have?" I said. And his completely predictable answer? Well, of course. This is Korea, after all. The music didn't stop there either. The other Korean classics of Abba and Whitney Houston were also on his phone, naturally. It didn't take long for him to ask if I had any music, which of course led to him asking to hear my music. I decided to play him "Rolling in the Deep" by Adele because I remembered how much my students at the high school loved that song (as do I). He was amazed by her "husky" voice, and kept asking about it all day...and even tried to download it on the bus ride home. Anyway, that should paint a picture of what my bus ride there was like. 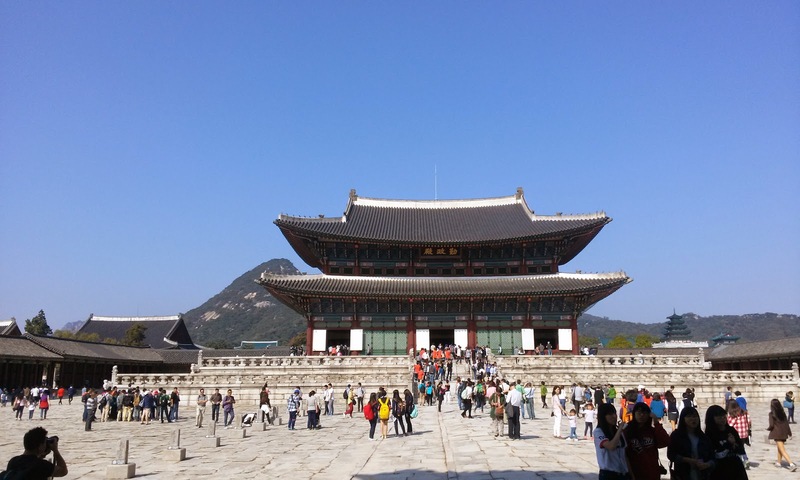 Once we got to Seoul the first stop was at the Blue House (like the White House in America). Unfortunately I wasn't able to go in because my name wasn't put on "the list" early enough. Instead, I sat on the bus with my music and my cell phone. Have I ever mentioned how thankful I am for Kakao talk and friends back in America have time to talk to me? I didn't mind just hanging out for a while--especially since the bus driver, who apparently had pity on me came over and gave me a coffee. Love those random Korean moments of kindness. After everyone got back from the tour it was time for lunch, which was kimbap in a nearby park. It was an absolutely beautiful day, so I couldn't complain. Definitely beats sitting in school. 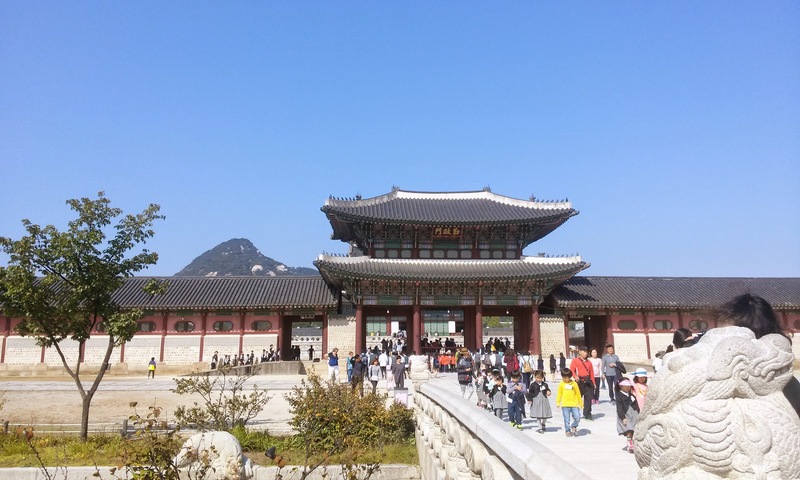 After lunch we went to Gyeonbokgung Palace. Although I've been there before, I was happy to go back here again, especially since it meant being accompanied by adorable small children. On that note, I should mention that my school has two new students who were born in America. One girl is in third grade and the other is in sixth grade. Their parents are Korean, but these girls see themselves as American and they speak English as their first language. 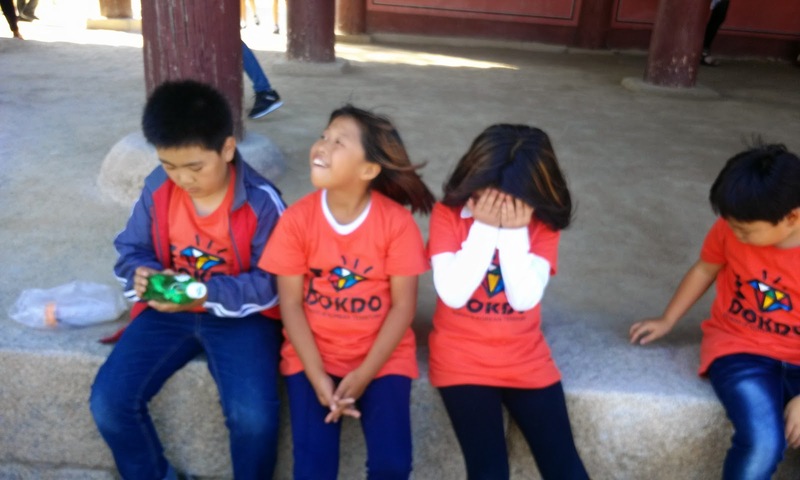 These girls have been having a hard time adjusting to life in Korea, especially since they don't always understand when people speak Korean to them and things such as reading and writing in Korean are especially difficult for them. 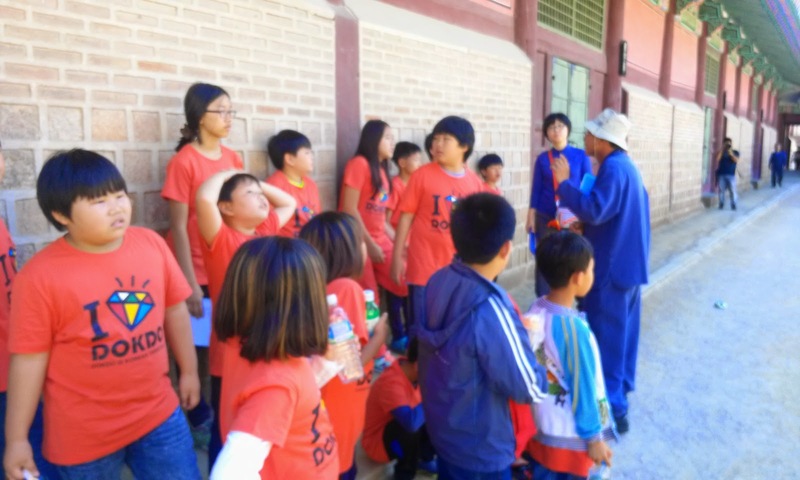 Although in America ESL programs are pretty standard, to have someone who isn't Korean in a Korean public school is rare and the students don't receive any additional services. 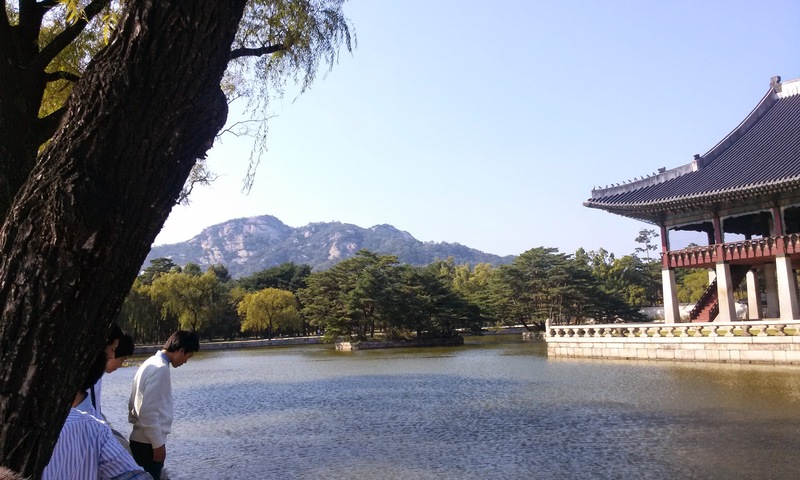 She didn't understand what the tour guide was saying during the tour which promoted her to tell me "well, at least we can not understand together." And that's pretty much when my heart broke. Or, it might have been when she told me about how sometimes she cries because she misses her friends in America. Gosh kid, you're killing me! By this point in the field trip it was afternoon, which reminded me of another thing about small children--they get tired easily. I don't think the kids were really paying attention to the tour guide at all because they were simply exhausted by this point. As we were walking out of the Palace, the American student told me "well, at least I didn't learn anything today." I mean, that is the point of field trips, isn't it? Add in another bus ride back home with a snoring CT right next to me, and that was pretty much my day. It wasn't the most exciting day for me, but I really did enjoy being around the kids. They are just SO CUTE. It's especially nice now having the girls who speak english. 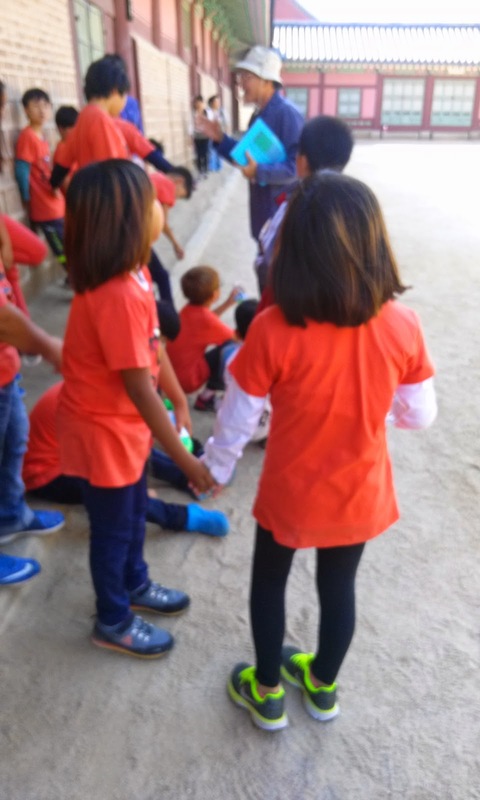 As cute as the other kids are, not being able to really communicate with my students takes away a lot of the fun of teaching. Even if it's only two students, it's nice to be able to really get know some of my students for a change. Just look at those tired kids! 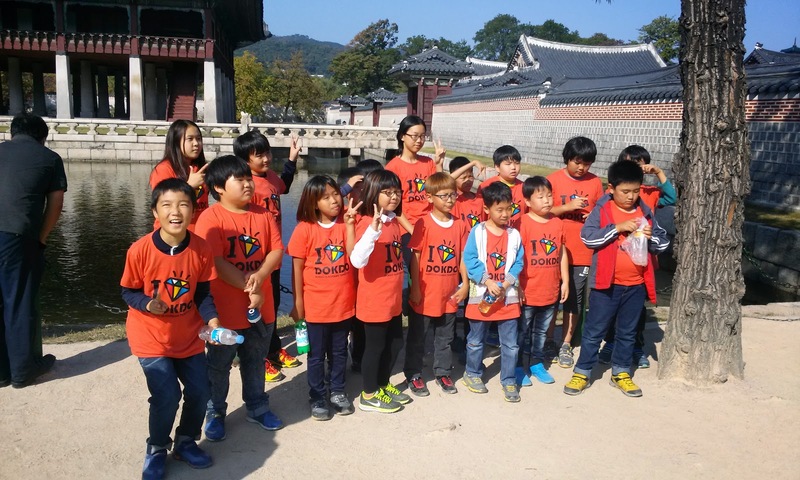 Yes, their shirts say "I love Dokdo. Dokdo is Korean Territory." Because, Korea.